Photos are much more than a medium to keep your cherished memories closer—when framed artistically, they become a part of the overall décor. Framing these moments elegantly, we present a wide range of vivid photo frames, including some classically themed options. Now, you can preserve memories and liven up the décor without any installation or space issues. Available in a wide range of sizes and shapes, select a frame that complements the existing décor. You have the ease of finding single photo frames and beautiful collage photo frames systematically categorized for a better online shopping experience. 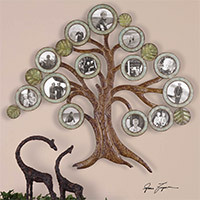 Some recommended options include the Natane Decorative Metal Wall Art and Maple Tree Hanging Photo Collage—two of our most popular collage photo frames. Photo Frames There are 31 products.